Are you looking for a reason to escape to St. Petersburg, Florida, or perhaps even to Paris or the West Indies this weekend? Well, if you like boat shows, you now have an excuse to start packing. Of course, if you want to stay close to home, you can still whet your nautical appetite by going to a boat parade. There are plenty of those around the US this weekend and over the next couple of weeks as local maritime communities celebrate the holidays by parading lighted boats through their harbors and rivers. Snow is in the air, but the boats are indoors at the Nautic Paris Boat Show, which starts today and goes all the way through December 12, 2010. Here's the English version of the show's website. You're welcome. Looking to head even further south? 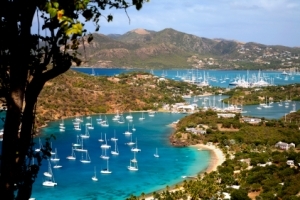 Check out the Antigua Charter Yacht Show from December 6 to the 11th. The big boats will be on display across both Falmouth & English Harbours (pictured). After a quick google search, we found boat parades happening this weekend all over the place - and many are major events this Saturday. For example, Long Beach California is holding their 28th Annual Parade of 1,000 Lights. On the Potomac, it's the Burke & Herbert Holiday Boat Parade of Lights. And Beaufort, South Carolina, is holding the Light Up The Night Boat Parade. There are also boat parades this weekend in Hyannis on Cape Cod and Daytona Beach, California. The best way to find out if there is a boat parade happening near you is to do a google search for the phrase "Boat Parade" along with the name of your city. More information is available for the aforementioned events in our boat show calendar. Additional boat parades can be found in a calendar BoatU.S. put out last week. If you know of any boat parades happening between now and New Year's, please add them as comments below and they will be approved and published right away.